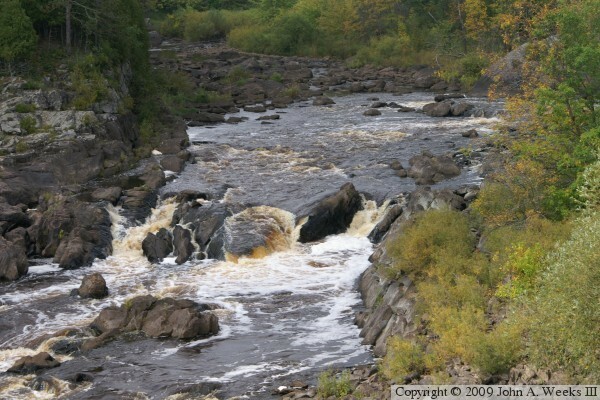 The Thomson Water Project consists of a number of components located in and around Thomson, Minnesota, and the nearby Jay Cooke State Park. 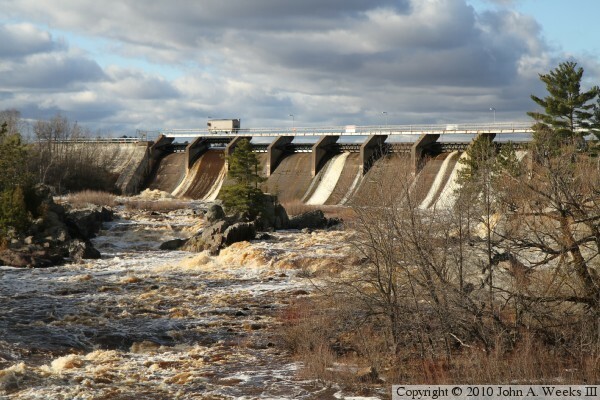 The dam features a remote power house that is 3 miles from the main dam. 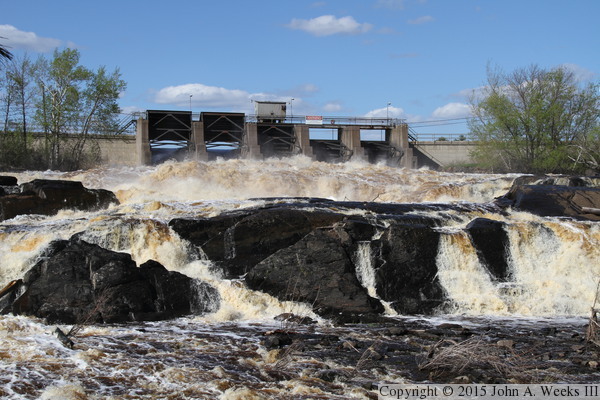 The project begins with the main dam structure near the Saint Louis River bridge on MN-210. 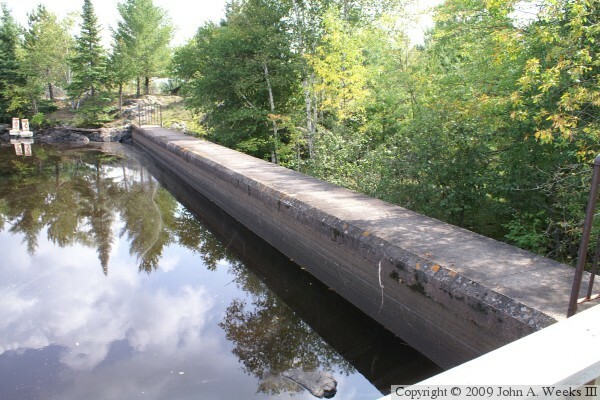 Water flows out of this structure and into the historic Saint Louis River channel. Water also backs up behind the dam forming Thomson Reservoir, which is about one square mile in size. A second dam structure and gate house allows water to flow into Forbay Canal. That 2 mile long canal feeds into a mile long set of underground pipes, which carry the water to the power plant. While the power plant is 3 miles from the dam, the river channel takes a bit over 5 miles to reach the power plant. 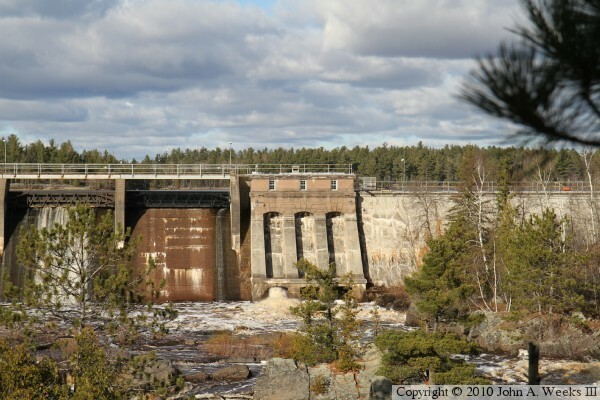 The Thomson Water Project was built by Great Northern Power in 1907. Great Northern Power was an operating division of the Great Northern Railroad. It was later transferred to the Saint Louis Power Company. 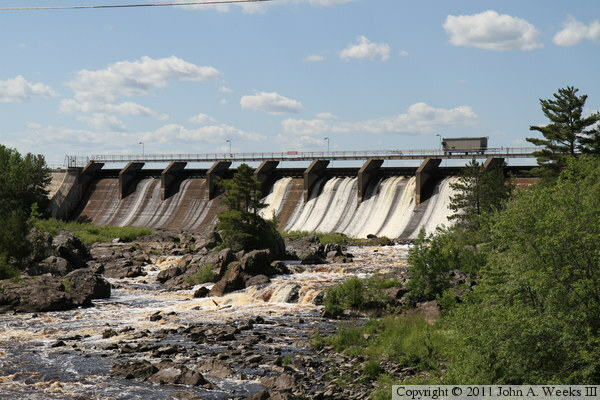 Today, it is known as the Thomson Energy Center, which is owned by Minnesota Power, which is a division of Allete, Inc.
A storm of historic proportions hit the Duluth area on June 19-20, 2012, dropping 11 inches of rain in some areas. 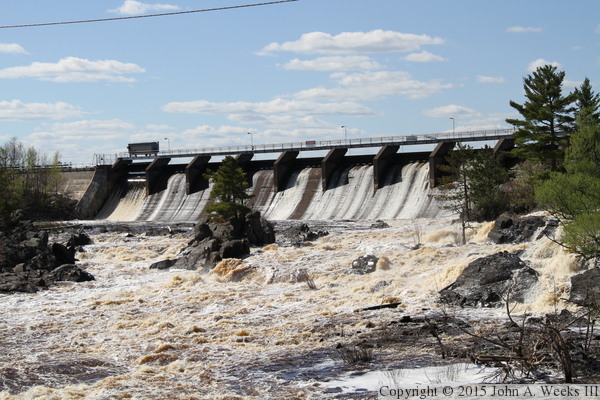 The Thomson Dam overtopped causing extensive flooding in the city of Thomson. Large amounts of debris fouled the gates at the gate house and intake house resulting in extensive damage to the structures. 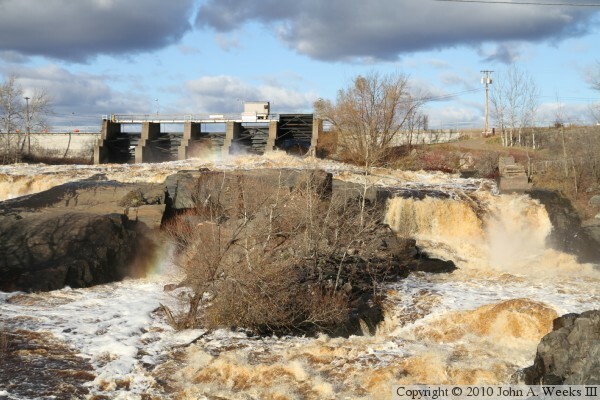 The power plant flooded causing a need to shut down the turbines, and the water damaged much of the electrical equipment. 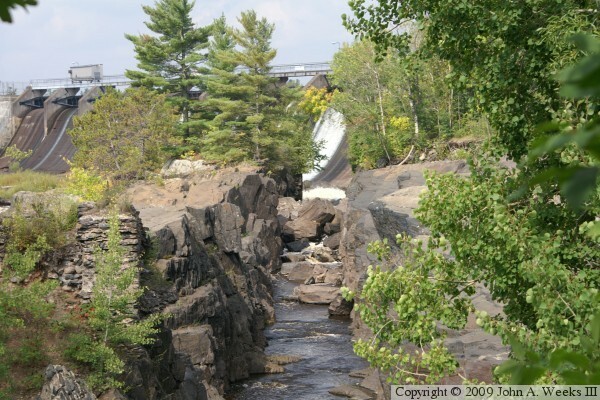 Later, the south wall of the Forbay Canal failed, causing the lake to drain cutting a new river channel through Jay Cooke State Park. This resulted in a long section of highway MN-210 washing out. 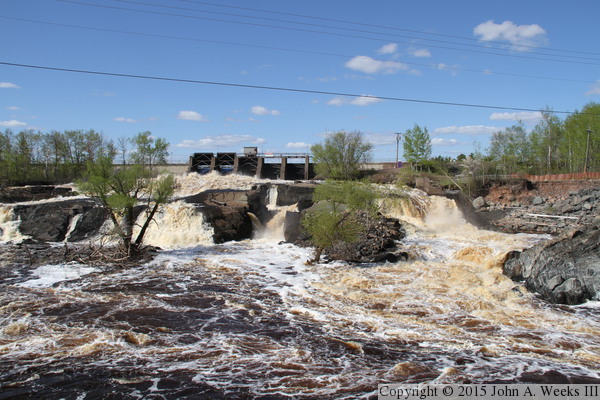 In addition, MN-210 was washed out near the Fond du Lac Dam and in front of the Thomson Dam. 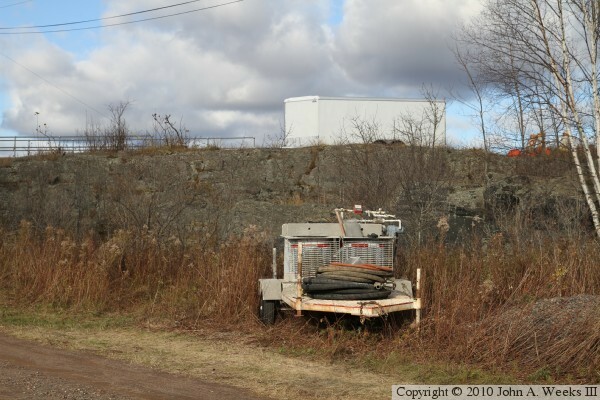 It took two years of work to bring the first generator back on line (unit #6), and considerable work remains to be completed as this update was written in late 2015. The photo above is looking north towards the older dam spillway and gates located towards the west end of the main dam control structure. 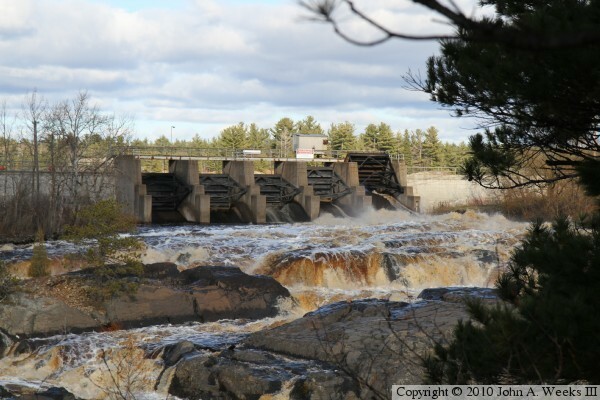 This vantage point at the west end of the highway MN-210 bridge is perhaps the best view of the dam, showing the cascades over the rocks just downstream of the dam. 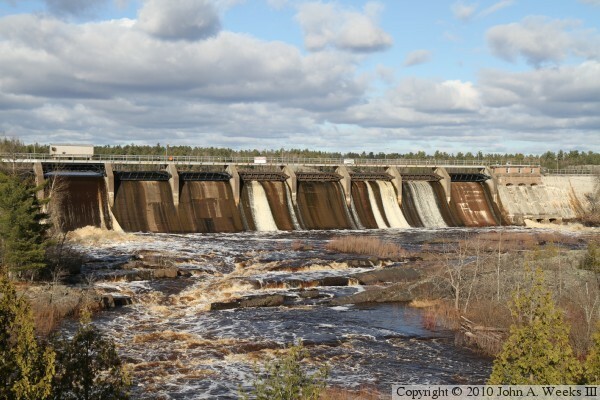 The photo above is looking north towards the control gates at the Thomson Dam, as seen from the Kayak and Canoe Institute Outpost parking lot. The photo below is a close view of a channel that was blasted through the rock back in the logging era. Remains of some type of structure is located just to the left of this channel. 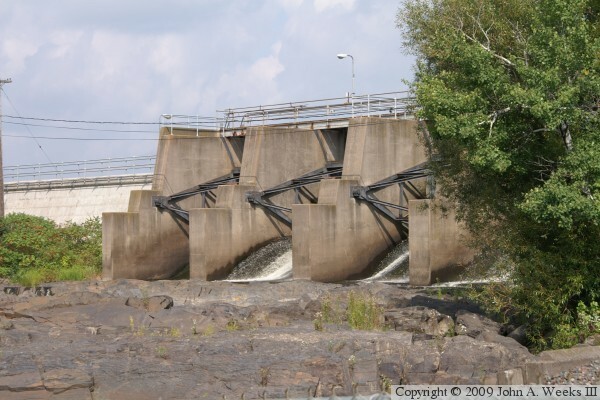 The photo above is the larger group of control gates located on the east end of the main dam structure. There is no good clear view of these gates due to the large rock formation located just downstream, as seen in the photo below. The channel through these rocks was also blasted, and again, we see some logging era foundations just to the right of the channel. 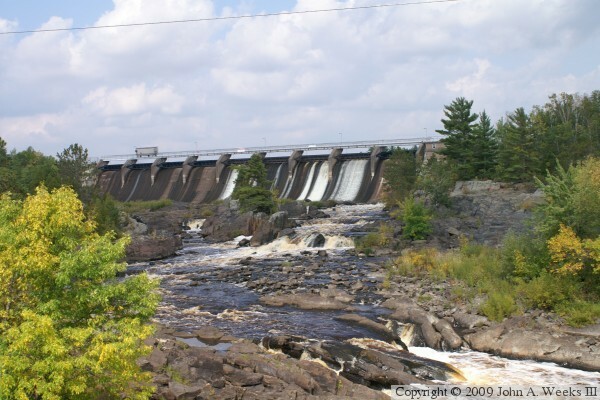 The photo above is the eastern section of the main dam control structure as seen from highway MN-210. 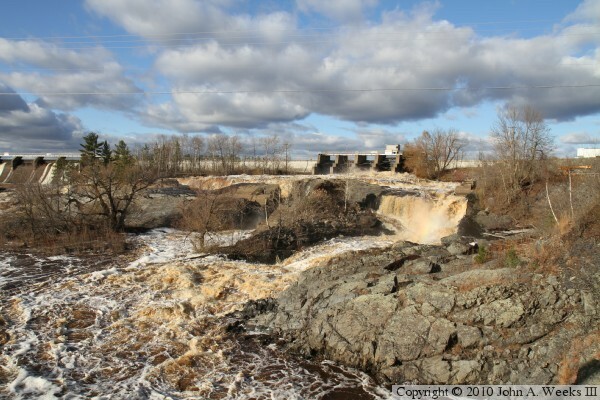 The photo below is a small falls where water flowing through the dam collects into a channel before passing under the highway MN-210 bridge over the Saint Louis River. These two photos are views of one of the longer of the concrete walls that fill gaps between rocks along the south side of the reservoir. 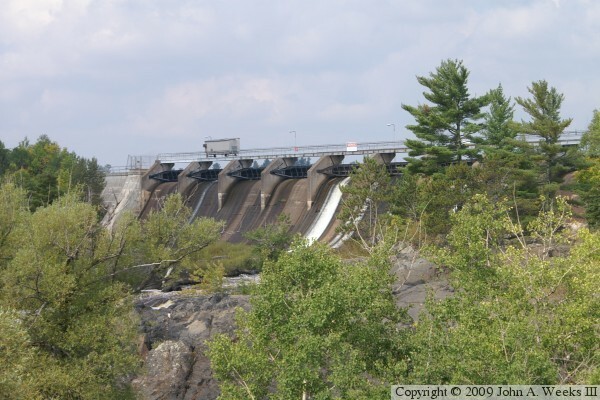 The photo above is the front of the dam, while the photo below is the back side of the dam. The railings are to discourage people from walking across the dam. The water is at least 20 feet deep, and the front side is a stagnant pool covered with algae. 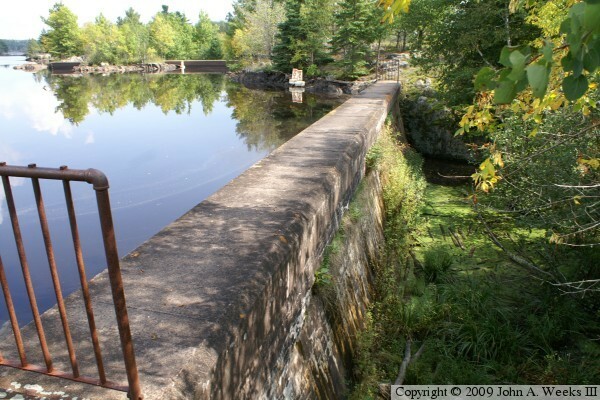 The photo above shows three more similar concrete dams filling gaps between the rocks. These structures are located just east of the UMD Outpost pier, which is just east of the main control structure. 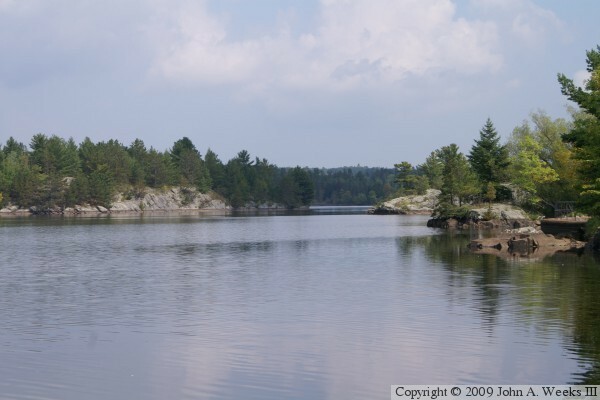 The photo below is a small inlet between the rocks at the leading edge of the reservoir. The photo above is looking east from the UMD Outpost pier. The rocks to the right are the south wall of the reservoir, while the rocks to the left are part of a chain of islands running towards the east end of the reservoir. 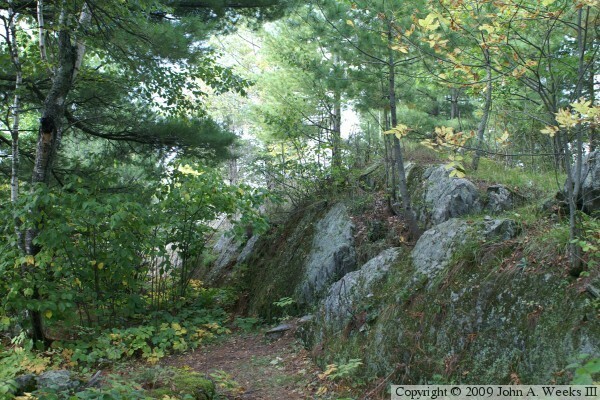 The photo below is a view of the rocks along the trail leading from the UMD Outpost to the pier at the canoe landing. An unusually powerful storm dropped a foot of snow across northern Minnesota in late October, 2010. The temperature rose just after the storm, resulting in that snow melting very quickly. 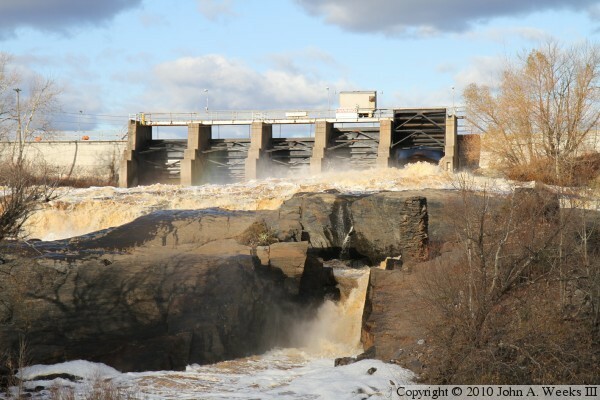 Much of the snowmelt ended up in the Saint Louis River, resulting in a spectacular water show downstream of the Thomson Dam. These two photos, and the ten that follow are from October 30, 2010. The photo above is the western section of the main dam control structure as seen from a ridge just west of the river. 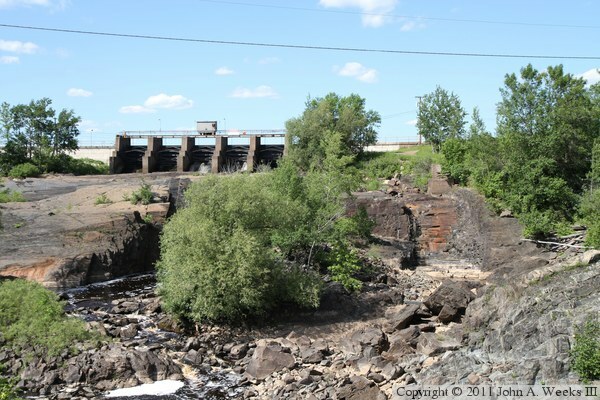 The photo below is the same section of the dam as seen from the west end of the MN-210 Bridge over the Saint Louis River. These two photos are closer views of two sections on the western end of the main dam control structure. 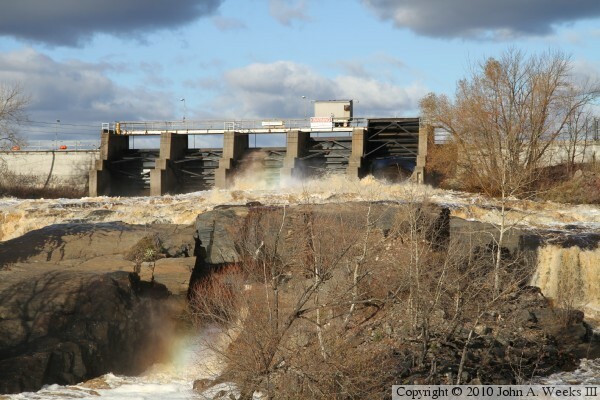 The photo above shows one of the spillway gates open, allowing a 36-foot wide torrent of water to pass over the dam and into a normally dry area in front of the dam. 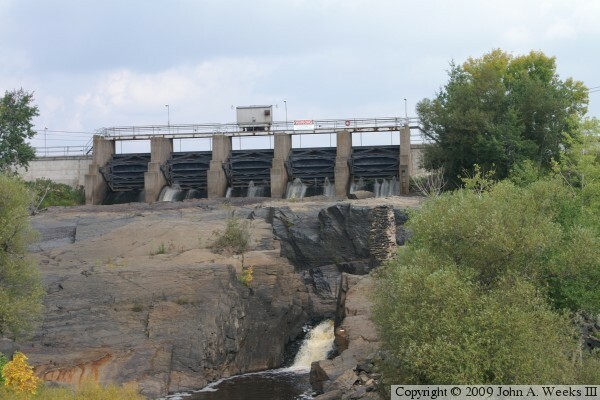 The photo below shows the series of three smaller dam gates. 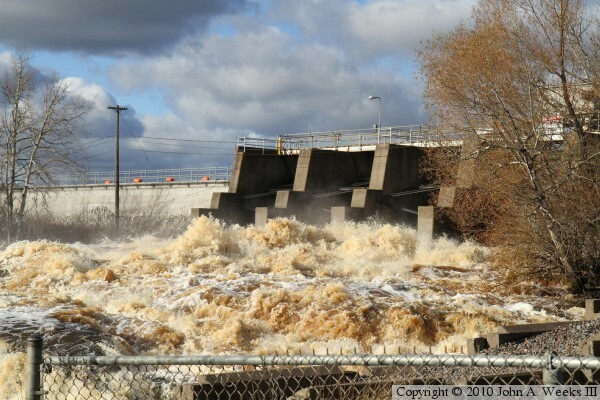 These gates are typically the only gates to be used during normal river flow levels. 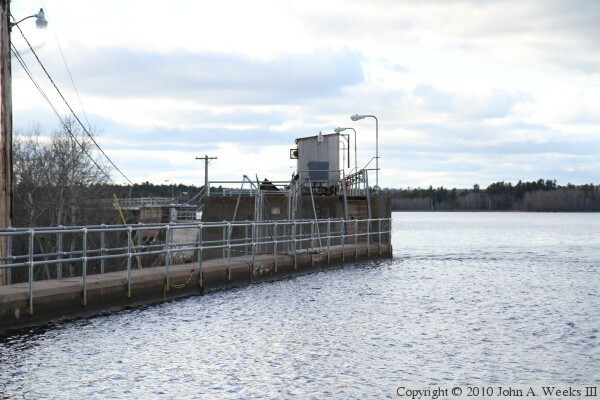 The photo above is some maintenance equipment that is parked at the east end of the main dam control structure. I suspect that this is part of a late season dam maintenance project, possibly one that was scheduled when the river flow is typically very low. 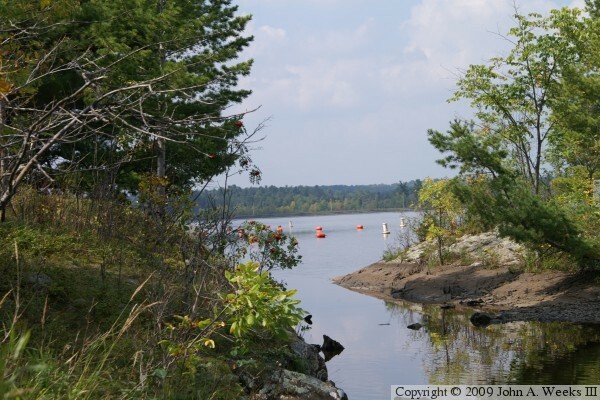 The photo below is looking west along the reservoir side of the Thomson Dam. The small building on top of the dam is a mobile crane that is used to raise and lower the dam gates. 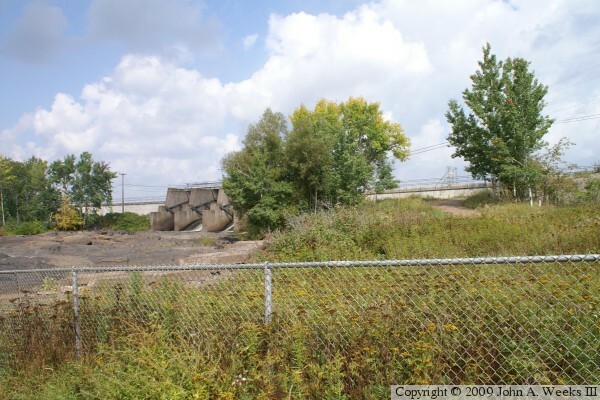 These two photos are the eastern end of the main dam control structure. This 5-gate structure appears to be newer than the gates on the western section of the dam. The photo above is from an overlook at the parking lot for the University of Minnesota Duluth Outpost. The photo below is a view from a rock ridge on the west side of the river channel. These two photos are views looking north towards the east end of the main dam control structure. The photo above shows the remains of an older water control structure from the logging era before the Thomson Dam was built. The photo below includes faint rainbows above and below the rocks in the center of the photo. These two photos are views looking north from the highway MN-210 Bridge over the Saint Louis River. The photo above shows the water flowing out of the newer 5-gate structure as it splits and flows around both sides of a stubborn section of 1.9-billion year old rock. The photo below is a wider view from the same location that includes views of both the eastern and the western sections of the main Thomson Dam control structure. 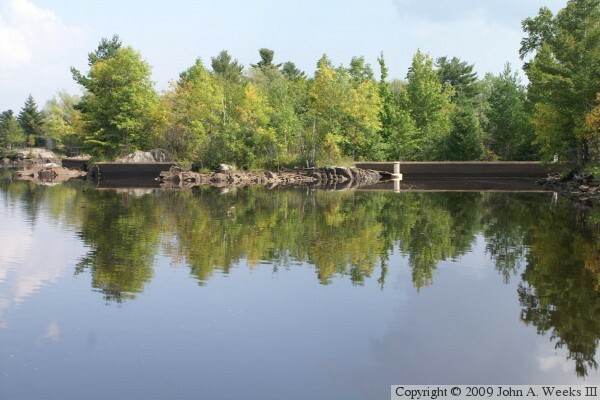 These two photos, views from the nearby Minnesota highway MN-210 bridge, show that the water flow is back to summertime normal levels here in July of 2011. These two photos (and the two that follow) are views from the summer of 2013. 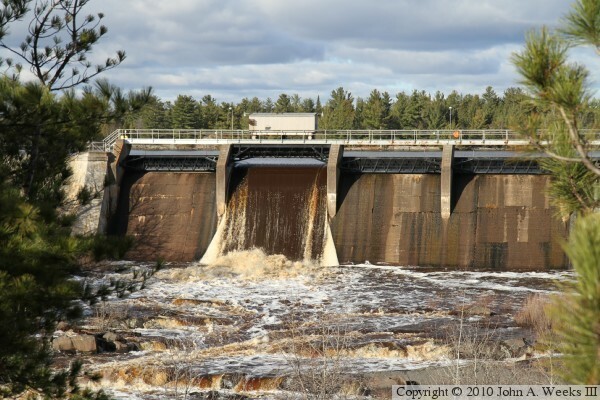 With the Forbay Canal damage being repaired, the water that normally was diverted through the canal and power plant returned to the Saint Louis River channel. This resulted in large water flows and spectacular views that haven't been seen in decades. 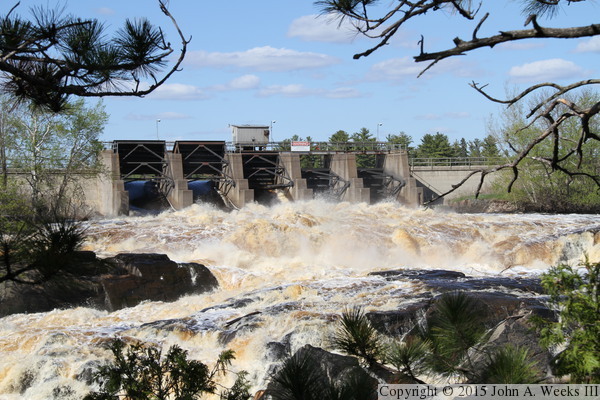 Two additional views from the summer of 2013 as the full flow of the Saint Louis River was coming through the dam. The photos look much like periods of high water in the spring despite this being the middle of summer.